Male Fangs are tall and muscular, and their sharp-featured faces are in most cases unshaved. Practically all their females are muscular and nimble, and have their longer hair strapped together so they do not disturb their everyday work. Because of their lifestyle enforcing the Fangs to dwell continuously in the open air, most of them have tan. They are very energetic and lively beings. They simply emanate lifeforce, primal joy and energy. They wear leather clothes, and bones and skulls treated as adornments. Studs and chains also are worn – the Fangs are dangerous people and they want to look like one. Every one of them carries a weapon, at least a short knife at the belt. It is not important whether the owner is a warrior, a farmer or a shepherd. Every one carries a weapon. Every one. Trophies are another proofs of valor. Each of the Fangs tries to wear or carry their most valuable trophies, if possible. Many of the Fangs have also tattoos as symbols of their status in the clan. The Fangs are very sincere by nature. They speak openly and do not choose their words. They love deeply, hate whole-heartedly, and value their friends above all. They are joyful and they love amusement. The Fangs find great pleasure and delight in fighting. However, the fight must be honorable and the fighters must observe some rules. There are acts considered proper and improper, and life of each of the Fangs is judged according to them. However if the opponent is really dangerous or fights unfairly, it is allowed to pay them back in their own coin. Each of the Fangs boasts their victories and successes, they can put them into proper words and describe them to their companions. 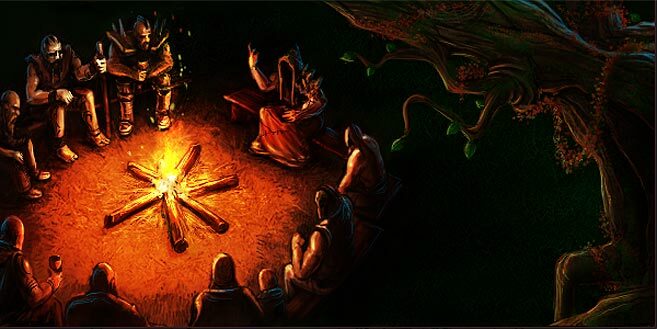 Most often, it takes place in a tavern or by the camp-fire, when they drink ale or mead. The best of the storytellers are treated with great respect. They live close to nature, but they do not care for it. As a stronger race, they take what they need. But their Shamans are guardians of the common sense. Because of some events from the past, exaggerated by myths and legends, the Fangs hate dragons whole-heartedly and kill them wherever possible. The Fangs are divided into different tribes. These tribes have various customs and traditions, but in every tribe, shaman and chieftain are the most important persons. Apart from them, the eldest warriors have the highest status in the society. Many people admire their battle experience, wisdom or number of enemies killed. The eldest feel obligated to help young, inexperienced Fangs. They teach them how to fight, how to survive in the wilderness, and other necessary skills. According to their occupations, the Fangs are divided into warriors, craftsmen and supporters. The last group includes fishermen, huntsmen and farmers. 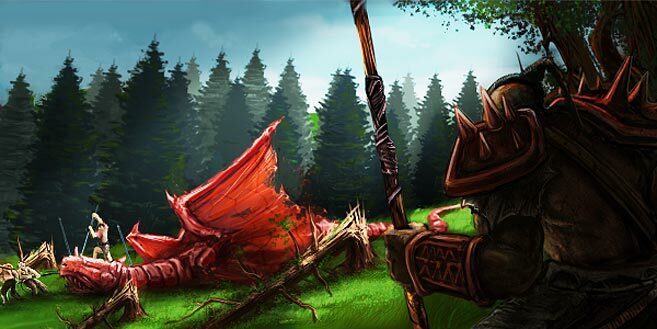 Although fighting is very important to the Fangs, members of their society understand that without the toil of the farmers, huntsmen, fishermen or blacksmiths, it would be impossible to wage war. So the non-battle occupations also enjoy respect. Equality of male and female rights exists in the Fangs society. For many generations, females were treated as incapable of fighting, but thanks to dedication of some of them, the situation changed. Now the females fight too, so they are equal to males. The Fangs' architecture is most of all simple and useful. Most buildings has more than one function. So the dwelling-houses are also warehouses, and the main hearth is used both for feasts and as a signal fire. 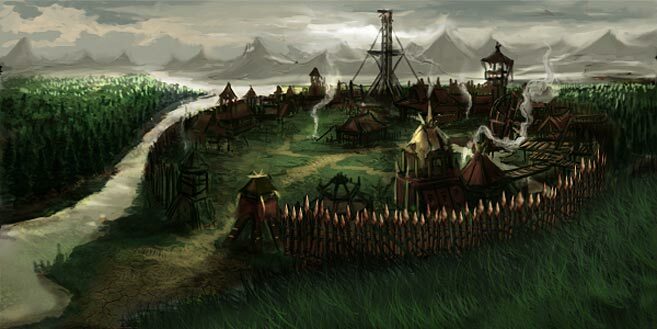 However, the most important structures in any Fangs village are its stockades, protecting the village from an assault. Skulls, bones, hides and chains are frequently used elements in architecture and ornamentation. Some tribes chose nomadic mode of life. It is these tribes that most often raid villages of other clans. Whole families are able to wander along the coast or rivers, having only a herd of Saurs (used as both mounts and source of food) for companions. First encounters with dragons took place centuries ago. Initially, the great beasts incinerated single villages and devoured domestic animals. However, as the years went by, they actions were becoming more and more devastating. First attempts to fight dragons led to defeat. The beasts were too strong even for the best warriors. Only when Shamans mastered the destructive power of fire and the hunting methods were improved, the Fangs huntsmen gained advantage. 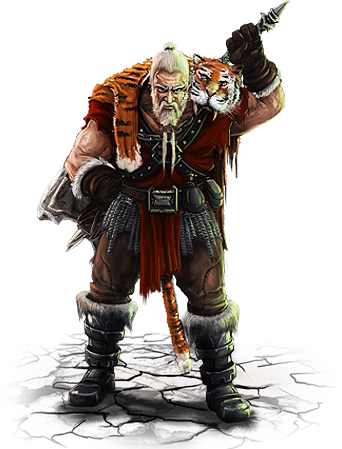 During one of the first dragon raids, a group of Warriors and Shamans managed to kill two beasts after a long and hard fight. Since then, the most able Warriors are called to serve as Dragon Slayers. 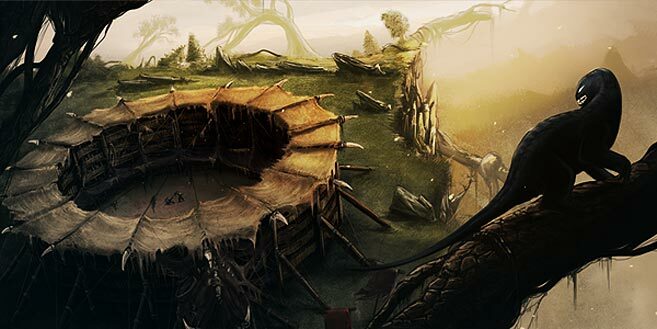 Dragon Slayers have their abode in Dor-Galaz Keep in Dragon Mountains. There, they train slaying dragons and skinning them. A Dragon Slayer may be recognized by a dragon trophy worn in a visible place. 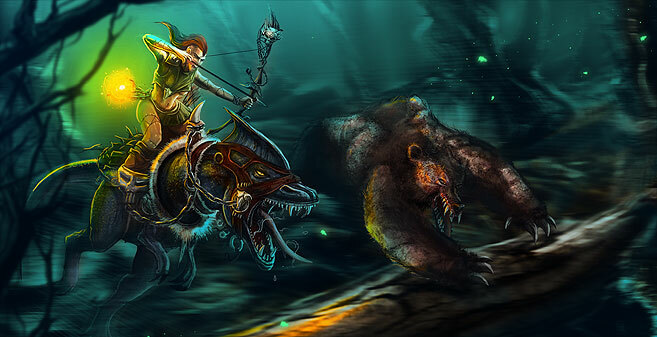 The trophy comes from their first or the largest beast slain. In spite of the fact that they come from various tribes, all Dragon Slayers act as brothers. From among all warriors, it is Dragon Slayers that enjoy the greatest respect. At first, the Fangs were deciding their disputes in two ways. The first option was to seek advice among the older and more experienced members of the tribe. Their decisions were final. The other option was to fight. Forms of the fight were various and depended on importance of the issue. Each tribe was resolving its problems within ti and each one had a slightly different set of rules. With time, a question of resolving dispute between tribes arose. The Fangs might resort to duels, but because of various rules of dueling in the individual tribes, no one was able to determine who in fact won. After long deliberations, the chieftains decided to standardize the rules. As a result, the Grand Tournament came into being. Rules of the Grand Tournament were carved in Goraz Rock. It was named after a chieftain who – according to legends – stated the place for the Arena and defeated all opponents in the first Tournament. From many generations, the Rock rests at the Arena entrance. The stories are shown on the Rock in the pictographic form, so anyone can understand them. The Fangs impersonate the primal force of nature, and draw their power from nature. Those who are able to control nature are called Shamans, less often Druids. The Shamans derive their power mostly from the destructive and fierce element of fire. However, the Fangs use magic very rarely but in exceptional situations. Too frequent use of magic is considered a weakness. Common opinion is that a true Fangs is able to cope with any problem by themselves.